We wouldn't quite call it an annual tradition just yet, but this winter does mark the third in a row where Ona has released a scrumptious new laptop / camera bag just before the all-important holiday season. Following the original Union Street messenger and the Camps Bay backpack is the Brixton Leather -- a leather-clad iteration of the company's more compact messenger case. For those unfamiliar with the brand, it specializes in high-end, high-quality bags that both ooze class and hold the things that bona fide nerds care about. 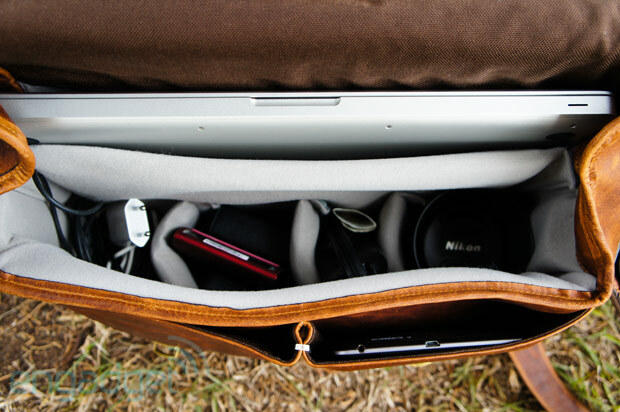 The internal compartments act as a paradox from the traditional-looking exterior, being thickly lined with customizable padded inserts that are sure to treat your smartphones, hotspots, ILC cameras and DSLR lenses with care. Oh, and your ultraportable laptop. 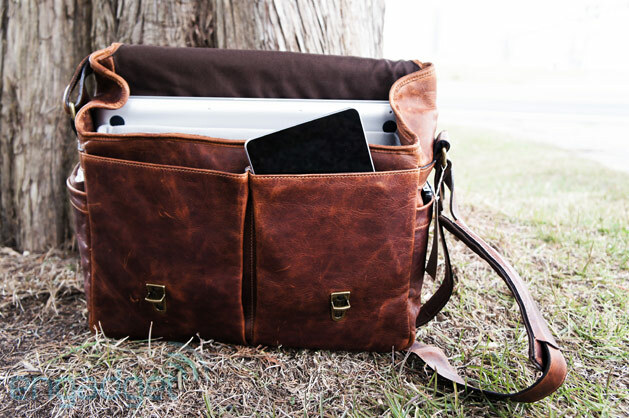 Join us after the break as we take a closer look at one of the world's finest gadget bags. If you've got the cash, there's hardly a sexier messenger bag out there that caters to your rotating gadget arsenal. This is why you spend more -- significantly more -- on an Ona bag. If you're a highfalutin city dweller that needs to nail the first impression on a daily basis, you'll understand the value in spending more on a bag that exudes style. For those in a less bombastic role, you'll need an awful lot of personal warm-and-fuzzy to justify the $419 MSRP. Now that we're beyond that, it's worth pointing out that there is precisely nothing about the Brixton Leather that isn't top-shelf. The Italian tanned leather is coated with a light, practically invisible wax, which proves extraordinarily useful when schlepping through the rain. Much like the company's other bags, this one too sheds water like a champ. It's too pretty to take out into bad weather, but should bad weather find you, at least you can dash knowing your contents are protected. The bag just feels amazing to the touch. The leather is soft enough to draw oohs and aahs from those who caress it, but stiff enough to retain its shape when you plop it on the ground. The carry strap contains a heavily padded, slidable portion that makes hauling a load that much easier, and you can clip things down with the two metal clasps on the front. The strap can be retracted for those who prefer the "over the single shoulder" look, or let out for the "toss it across my back" approach. In practice, both worked fine, but we ended up preferring the latter approach. Why? Weight. The biggest negative here is physics. Fine Italian leather is spectacular, but it's heavy. Compared to cloth bags with no rigidity whatsoever, this bag is going to be a far bigger burden on the wearer. Even empty, there's no mistaking that you're hauling something around. It's not a dealbreaker by any means, and those who only have to walk short distances before finding a subway floor to rest it on won't mind a bit. It's just something to keep in mind -- you wouldn't want to use this as your day pack for an hour-long hike. At $419, the Brixton Leather is on the extreme high end of what we'd reasonably pay for a messenger bag. There's no question whatsoever that this bag is aimed at a very specific class of customer -- a class where there aren't a lot of individuals present. But in truth, we can't think of too many other outfits that are serving the niche. Elite-class bags that are geared to handle laptops, cameras and other technology aren't easy to find, so it's pretty awesome to see this particular option hitting all the right notes. 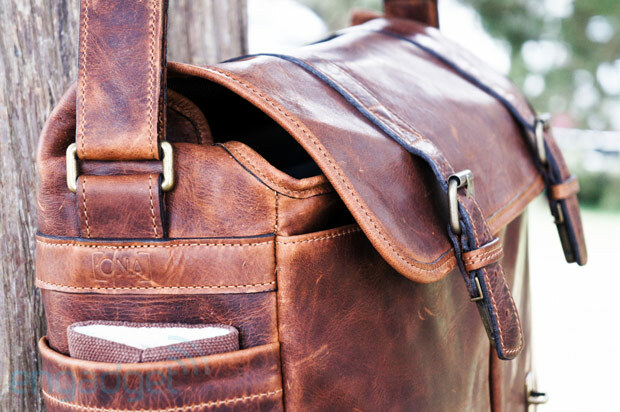 For the busy professional who is willing to invest in a bag that'll last a lifetime, and look good long after its wearer stops caring, this one's easy to recommend. It's soft yet rigid, and it holds an astonishing amount of kit. You'd never guess how much stuff you can slip in here by glancing at the exterior. Yes, you'll need to be okay with hauling around a fairly heavy messenger, and you probably won't ever find a good use for those two side pockets, but everything else about this thing screams precision. And, if you're looking for the perfect holiday gift for that dude or dudette who you really owe one to... well, you needn't look further than the source link below.